Mesa Boogie Mini Rectifier Twenty-Five: Small? It’s Enormous! It’s a name associated with big, stadium-filling rock tones… but this Boogie’s tiny enough to fit in a Dual Rectifier’s back pocket. Can it still do the job? 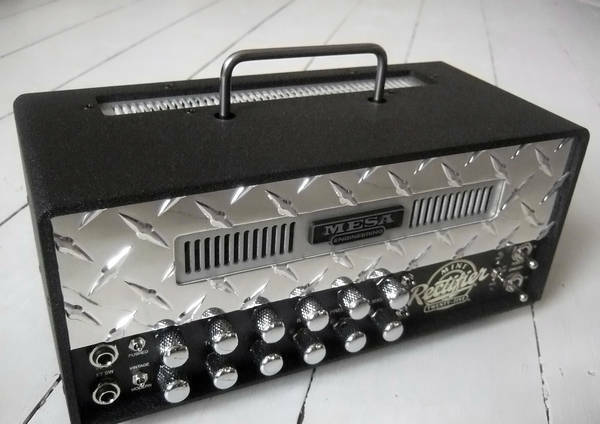 And so Mesa Boogie, masters of high-gain awesomeness, succumb to the ‘lunchbox amp’ craze. The Mini Rectifier is an all-valve, two-channel head with the classic black-and-silver look of its big brothers, and it’s made in the USA to the company’s usual high standards. The only difference is that this 25-watter, driven by two EL84s, is a titch – placed on top of a 4x12 cab it actually looks slightly ridiculous, like a baby’s head on a rugby player’s shoulders. Tell the Mini Rectifier it’s ridiculous, however, and it will punch you in the face – hard. This is a genuine rock amp, as you’ll soon realise once you’ve plugged in a guitar at one end and a cab (even a little one) at the other. Features-wise, we’re dealing with a lot of versatility: both clean and dirty channels are switchable between 25 and 10 watts, each has controls for gain, presence and master volume plus its own three-band EQ section, and each has a switch at the left end of the control panel for more sonic tweakage: clean/crunch on 1, vintage/modern on 2. A channel-hopping footswitch is included, and there’s a valve-driven FX loop which can be hard-bypassed. 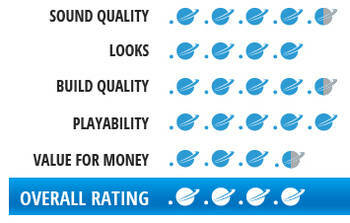 Even at clean settings, there’s nothing ‘mini’ about the tone on offer here. It’s full, clear and loud. Switch to ‘crunch’ and an extra gain stage takes you straight into scruffy blues territory, while over on the dirty channel it doesn’t take long at all to find the hard-rocking all-American tones – both old and new – that made Mesa Boogie famous. It certainly doesn’t sound less than half as loud in 10-watt mode, but this is a neat way of stepping down to a more restrained, softer-edged voice that could be very useful for recording. The Mini Rectifier is a great little amp that can produce just about every sound you’ll ever need to hear, both on stage and in the studio… but is it better than the amp that started this whole ‘lunchbox’ phenomenon, the already-classic Orange Tiny Terror? Well, yes, it almost certainly is – but then, it does cost about three times as much.